Be full of the joys of Spring…feeling happy, full of energy and enthusiasm. We’d say that pretty much describes the Kindergarten! 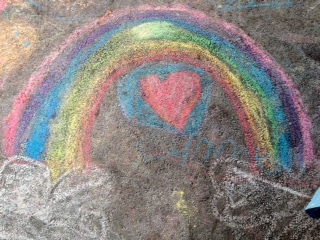 We’ve been, at least until the end of this week, enjoying some wonderful Spring weather in West Vancouver. Here’s some of the fun things we’ve been doing in class over the past few weeks. 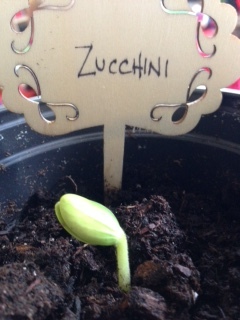 It was Earth Day on Wednesday, so we started our celebrations with some energy saving measures. We kept the lights turned off all day (including our twinkle lights) and were diligent about turning off the tap quickly after washing our hands in the classroom. 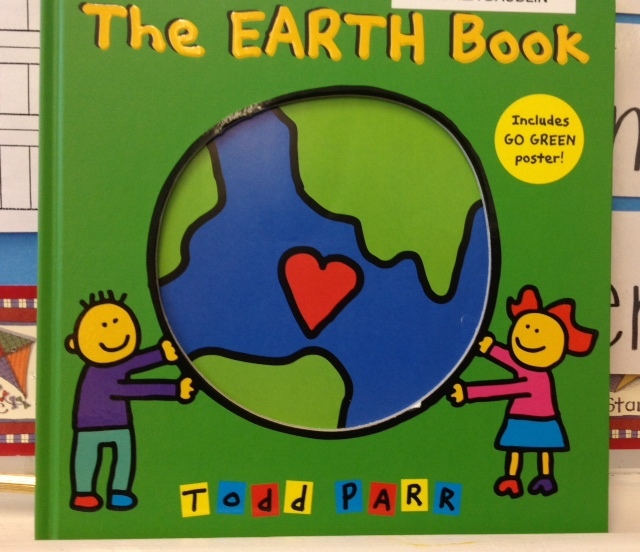 We read another book by the amazing Todd Parr, The Earth Book, recalled the main ideas of how to look after our Earth better and added on a few of our own, such as “Looking after our people and animals friends.” We each made a page for our class book to enjoy for the rest of the year. our school district called “Energy Explorers” to learn about some new and exciting ideas about energy use and conservation for Kindergarten learners. 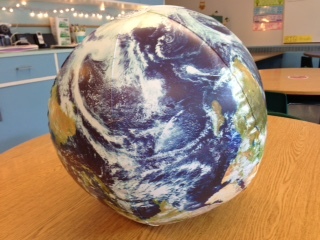 We received a lot of great stuff such as a teacher’s guide, big book and student resource books, but it was this fabulous earth ball that had the Kindergarten really intrigued. The children were fascinated watching us blow it up (it’s quite big). At the end of the day, after all of our discussions and what we could do to conserve our Earth’s limited resources, we passed around the “Earth” and each child stated what he or she would personally try to improve. We had a number of children say they would try “to not waste food and eat the leftovers….” Isn’t that awesome? 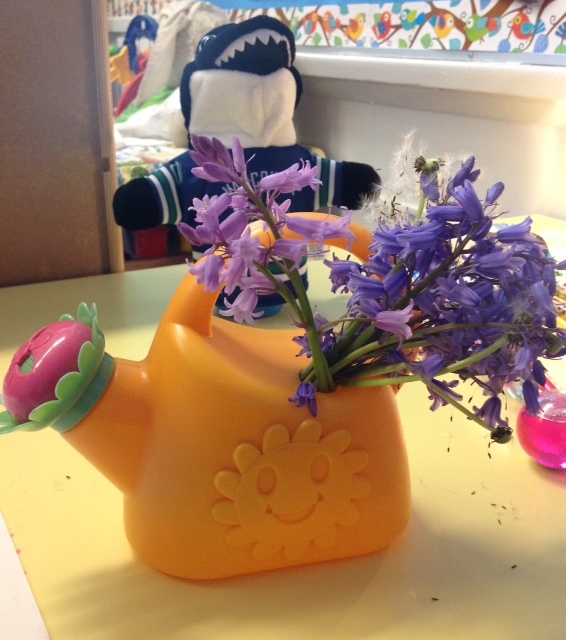 For Sharing and Special Helper this month, the children have been bringing in a “Sign of Spring” sharing. We’ve been treated to many wonderful items, including photos of our children in their gardens at home, drawings, plants and bouquets, and the children’s gardening tools like sweet little gloves and watering cans. 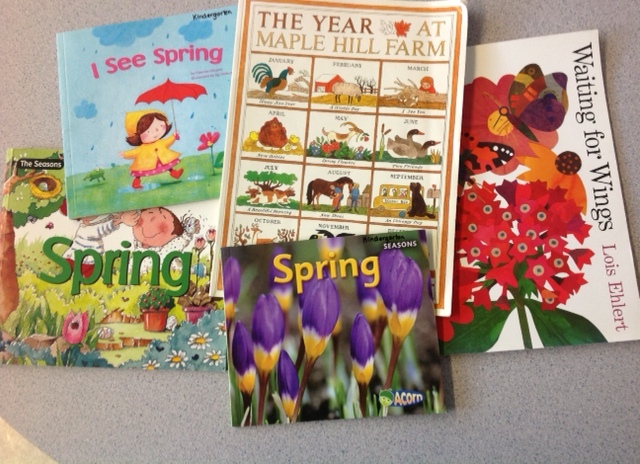 As always, we have some wonderful books about Spring and the seasons that we’ve been reading aloud to our classes. 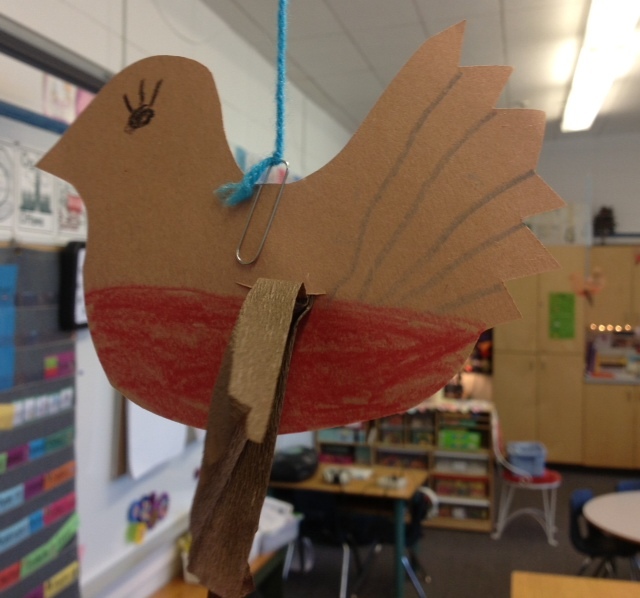 We’ve made more wonderful Spring crafts to decorate our classrooms. We’ve said it before, but one of the things we love about creating art or crafts is breaking down the steps over a few days so we can all really enjoy each step of the process. It gives us a natural way to delay gratification and creates anticipation for when we get to work on a particular project again. 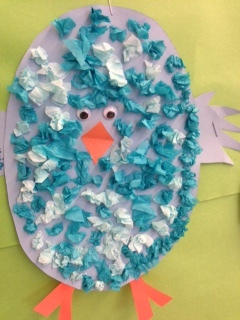 Blue Chicks: We made our blue chicks by crushing single squares of tissue and gluing them on with liquid glue to a construction paper backing. We’re always looking for activities that allow our children to develop their fine motor skills and this one was great as the children had to pick up the tissue paper squares, rub them together to separate the layers and then individually crush each one to glue it on. We took about three art classes to finish. Working with our hands while listening to great music is a calming activity and very satisfying for our classes. These cute robins were cut out earlier by ourselves and the children followed our direct instructions to draw in the eye, tummy and feathers as a class. Later that week, in small groups, the children were very interested in watching us make a cut in the bird, using an exacto knife, for the wings. The wings are a square piece of crepe paper which the children folded as a fan and we slipped through the cut. They look really adorable hanging from the ceiling, fluttering in the spring breeze when our windows are open. It’s hard to believe we’re almost at the end of April. We’re enjoying this time in the school year so very much with our students. Be full of the joys of Kindergarten.